Say TVR to any sports car fan and their eyes will light up as they think of the M Series of sports cars the British automaker cranked out from 1972 through 1979, sporty two-seaters with plenty of oomph. 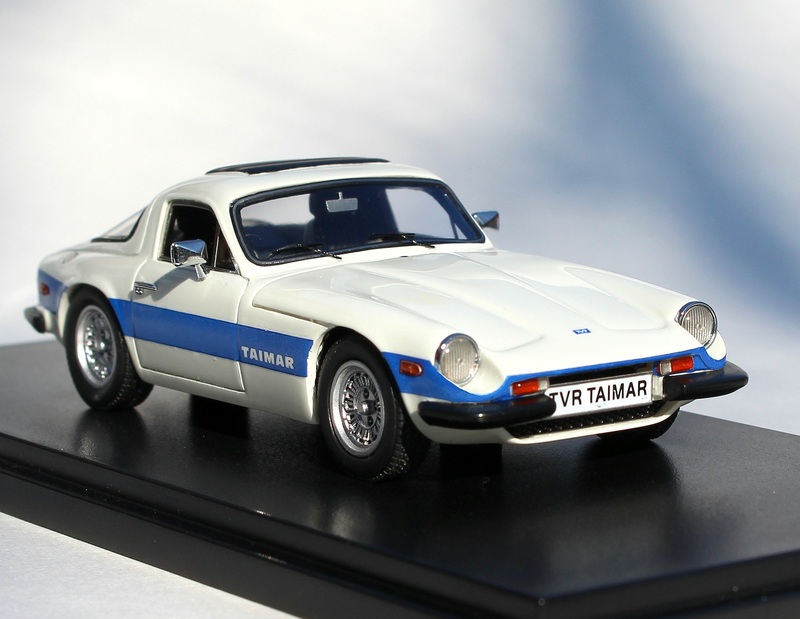 TVR was founded after World War II by Trevor Wilkinson, but sold to Martin Lilley in 1965 and he turned his attention to creating the M Series that includes the hatchback Taimar that Automodello has so beautifully produced in resin in 1/43 scale. This continues Automodello’s fine series of unique and small production run cars in a size that fits on anybody’s shelf or bookcase. This one will be offered in seven color schemes, while the similar TVR 3000M will come in three colors. 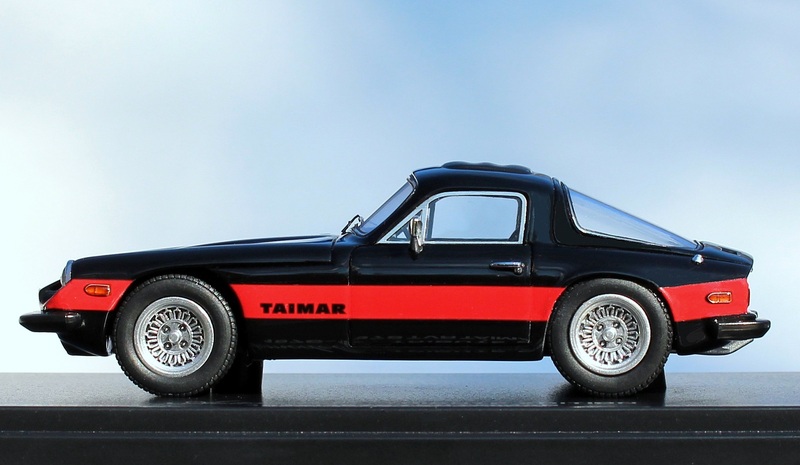 All will be extremely limited runs, the most for the Taimar is 79 units in white with blue stripe and black interior. The review model is black with a red stripe, with only 19 being made. Just 19 models in each of the remaining five colors will be made. Talk about exclusive! The 3000M started as a high-performance alternative to the 1600M and 2500M and debuted in October 1972, costing 2,278 pounds, a little more than it weighed, about 2,100 lbs. 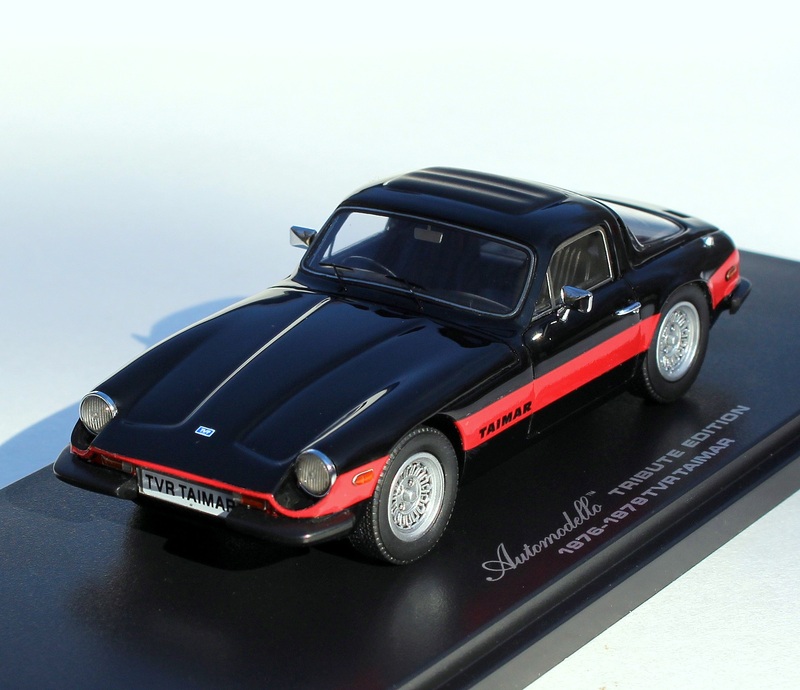 A tiny fixed fastback sports car powered by a V6, the M Series quickly gained popularity with racers. 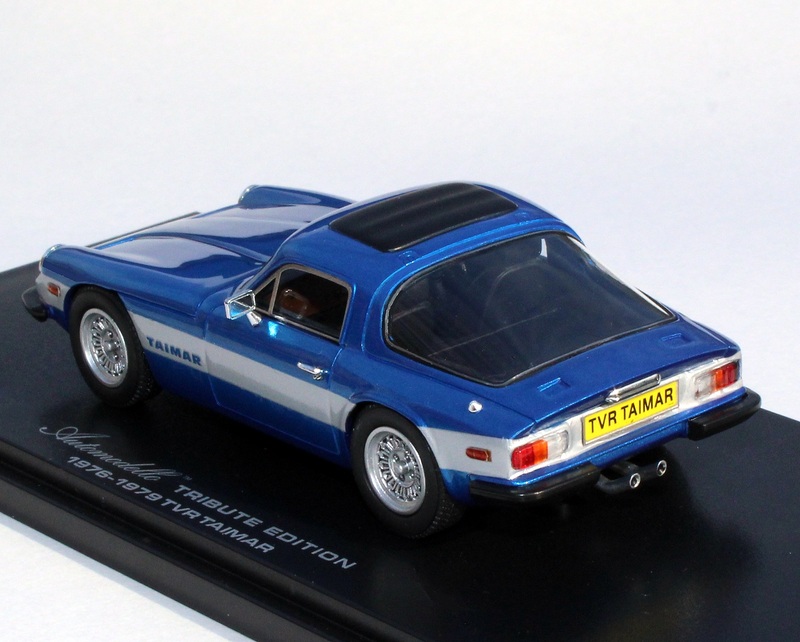 By 1976 TVR had developed the Taimar, which featured a fiberglass tailgate, or hatch. Familiar now, it was unusual then, especially because the hatch looked almost identical to the lines of the standard M Series, yet added functionality. Plus its hinges and releases were all inside the car, not affecting the car’s styling. 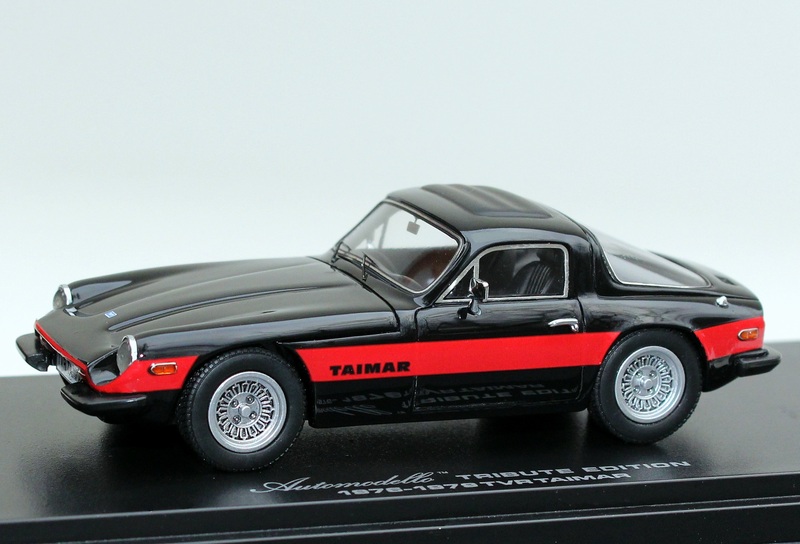 Two stories explain the car’s name, one saying it was inspired by Martin Lilley’s girlfriend’s name, Tayma, the other saying it was a combo of Tai (for tailgate) and Mar (for Martin). 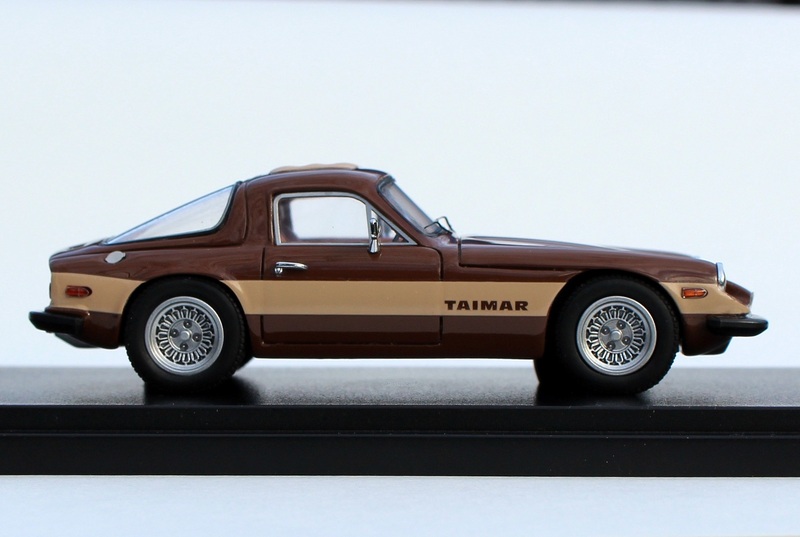 In any case, folks driving the Taimar on road now could easily load luggage in the hatch, while still driving a sporty car. 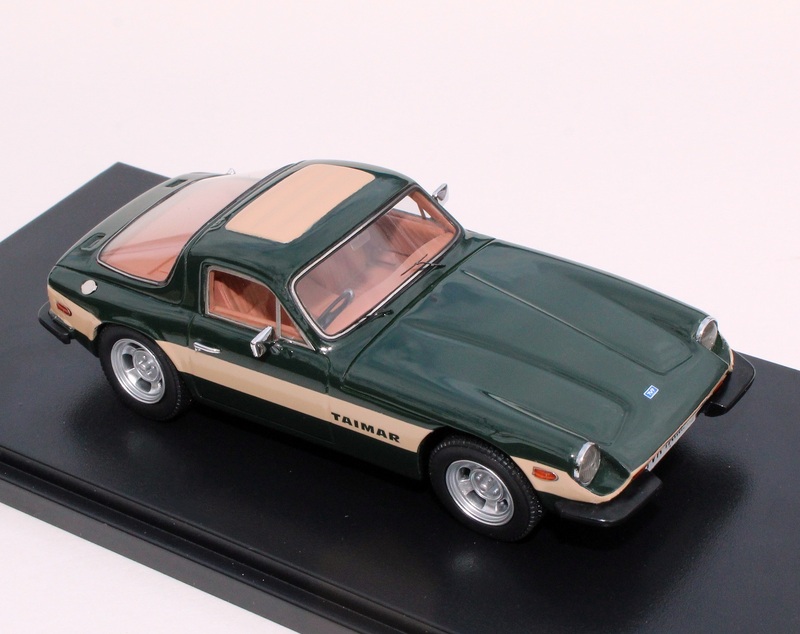 Ultimately TVR made just 395 Taimars, most with Ford’s 3.0-liter V6 that made 142 horsepower, but 30 used a turbo version of that engine, creating 230 hp. This was the first turbo in a British production car. Automodello again delivers a fine smooth glossy paint job with a crisply executed red stripe around the entire car’s beltline. “Taimar” appears on each side’s red stripe in black. Up top there’s a cool vinyl-look convertible top, really more of a sunroof cover as far as size. This was another unique feature of the Taimar, most were “convertibles” with this fold back roof. Tires are treaded but not branded and the TVR boasts intricate flat silver wheels that add to the car’s personality and flair. Inside are two black bucket seats and a wood-look dash with some dash instrumentation printed on its face, plus two floor-mounted shift levers. The TVR is right-hand drive. Another gorgeous model from Automodello. Other small-run versions (just 19 of each) are, blue with a white stripe, brown with a cream stripe, British Racing Green with a cream stripe, red with no stripe, and yellow with a brown stripe. All are $149.95, but $119.95 for the larger run white and blue model. 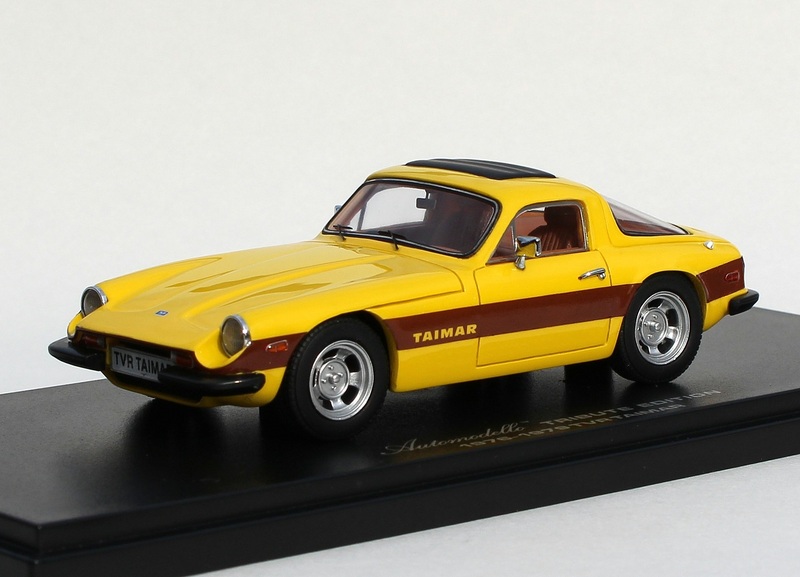 There are a variety of TVR colors from Automodello. Previous Post2016 Audi TT 2.0T QuattroNext PostWhat kind of driver are you?